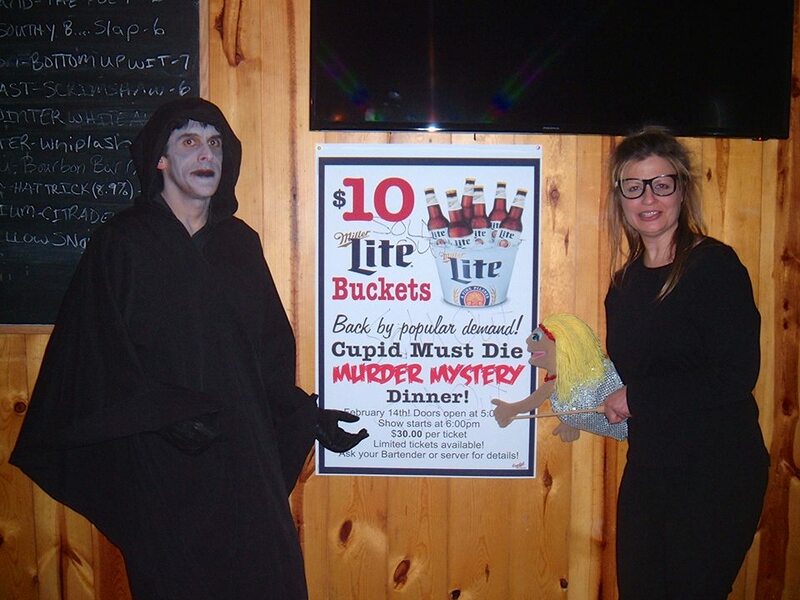 WT Productions was formed by Debbi Dennison and Carl Zeitler when they began to collaborate to co-produce and write the script for the murder mystery dinner theatre production Cupid Must Die! They continued these roles for the productions of Murder's Day and And the Murder Goes to... They also co-directed another murder mystery script they collaborated on called A Grovey Kind of Murder. Dennison and Zeitler partnered with Vero Vero Theater to present Seasonal Ties in December 2017. This collection of six short plays dealt with Christmas and the winter holiday season. They recently completed Seasonal Bows, which is a different collection of six short plays with the same style and theme. The team that brought you last year's successful Seasonal Ties rings in this holiday season with another collection of six short plays that takes Christmas and the winter holidays and looks at them from different perspectives. Seasonal Bows blends light comedy, dark comedy, and drama to put a unique spin on this traditional time of year. The six short plays include Write Your Own Christmas Adventure, Branching Out, Bowtiful, Holiday Leftovers, Final Bows, and Wrapped Up in a Neat Little Bow. As the holiday season approaches, people anticipate their yearly Christmas traditions: Christmas songs, decorating the tree, Santa Claus, time with loved ones, and so on. WT Productions offers a new production called Seasonal Ties that takes some of those traditions and stands them on their head. Ring in the holiday season with this collection of six short plays that takes Christmas and looks at it from different perspectives. Seasonal Ties blends light comedy, dark comedy, and drama to put a unique spin on this traditional time of year. The six short plays include For It's a Jolly Old Memo, Sure, Hands Off!, Global Warming, Three for the Road, and December 26th: The Aftermath. The original cast featured Nancy Braus, Steve Delaney, Debbi Dennison, Isabella Ford, Danny Glenn, Carolyn Larsen, Galen Malick, Stephen Pickering, Lori Rohr, Heidi Swarthout, Sheri Warren, and Carl Zeitler. You are cordially invited to the most glamorous post-Oscar party in Hollywood. Mingle with all types of people in the entertainment business including the most recent Oscar winning actress and resident diva, an up-and-coming director, a maven of red carpet reporting, a hapless and harried personal assistant, a well respected but often ignored multiple winner of the Science and Technical Academy Award, his niece from Kansas with an extreme fascination of movies and absolutely no filter in her comments, and a surprise guest who shows up wearing...well, you have to come to the show to find out. One of these characters will not survive the evening and another one of them will make sure of it! The original cast featured Bill Boggs, Debbi Dennison, Galen Malick, Valerie Meachum, Lynn Meredith, Cheryl Rice, and Carl Zeitler. Travel back in time to 1966. The newly formed Elk Grove Village Park District has received mixed reactions from the local community. A prominent and extremely upbeat citizen seeks to become the first director of the Park District and has organized a meet-and-greet event to win favor with the community. Several people join in the festivities: a grumpy and paranoid farmer, a children's librarian who carries around a stuffed elephant, a local businessman who is highly enthusiastic about a brand new TV show called Star Trek, a first-year high school math teacher who has the urge to protest pretty much anything under the sun, a village employee who writes the community newsletter but has aspirations of being a TV news reporter, and a free-spirit hippie outsider who has random premonitions. One of these seven individuals will die during the course of the evening. The other six will be suspects with motives, means, and opportunities to have committed the murder. The original cast featured Bill Boggs, Mark Brewer, Debbi Dennison, Vicky Giannini, Danny Glenn, Carolyn Larsen, and Carl Zeitler. It would be the typical Mother's Day brunch, but this family is anything but typical. Mom has had to wait for 2 weeks after Mother's Day to celebrate because her five offbeat children can never agree on anything. There's Neil, her favorite, who is most interested in himself, fashion, and being pampered. Anything or anyone else is a distant second. There's Jane, who goes all out to get her mother to notice and praise her. There's Mikey, who is part of the local forest preserve police but desperately wants to join the city force. There's Carrie and Terry, twins who are inseparable and have the tendency to finish each other's sentences. They believe they're identical twins even though they are not. And then Uncle Paul shows up out of the blue. He hasn't been around for decades. What does he have up his sleeve? One of these characters will die, and the rest of them will be suspects. Can you solve the case of Murder's Day? The original cast featured Nancy Braus, Steve Delaney, Debbi Dennison, Stan Kosek, Shazad Mehta, Tegan Rogers, and Carl Zeitler. It's Valentine's Day, and Cupid is hosting his annual exclusive party to celebrate love and romance. Not everyone is enchanted with Cupid on this occasion, however. Six quirky individuals--whom Cupid labels as "misfits when it comes to love"--have arrived at the party. These misfits include a self-proclaimed nerd who lives with her parents and is obsessed with baking and the Food Network, an eight-time divorcee who has just come from an event at which he performed as a clown, a successful business woman who has no time for love except for her six cats, a homeless man with a limp, an aspiring puppeteer with a severely flirty hand puppet, and the Grim Reaper himself. These six all have some issues with Cupid. During the course of the evening, someone is going to die. Will Cupid survive? Will love survive? The original cast featured Debbi Dennison, Danny Glenn, Carolyn Larsen, Julie Ostrow, Rhys Read, Eric Wang, and Carl Zeitler.